Enslow Publishers create engaging and easy-to-read nonfiction books for school-aged students. The six books I was asked to read and review have to do with different aspects of the Holocaust. I was excited to have this opportunity to evaluate these books because I have a strong knowledge of this period and I have been a Jewish educator for over forty years. I wanted to determine exactly what was being told and how the authors accomplished this. wrote about the lives of several heroic men and women. Although I was very familiar with the historic events in the book, I learned about other heroic episodes and the brave fighters who resisted and fought back. The second book I read was The Warsaw Ghetto Uprising: Striking a Blow Against the Nazis by Linda Jacobs Altman. I have read a great deal about the Warsaw Ghetto and the uprising in April of 1943. Ms. Altman did an excellent job of portraying the events through the actions of seven Jewish resisters and the Nazi general responsible for the ghetto’s destruction. She was able to show the desperation of the last remnants of the Jewish community without being too graphic. I chose James M. Deem’s Auschwitz: Voices from the Death Camp as my third book. Knowing full well of the unspeakable horror of this camp, I was curious to see how Mr. Deem would handle this story. He chose to write about Auschwitz through the experiences of ten of its perpetrators and victims. This series is recommended for middle and high school students. I feel the graphic nature of much of this book is too gruesome for sixth graders. Mr. Deem writes about burning bodies, crushing bones, Zyklon B and what the victims looked like after being gassed. I feel that this part of the Auschwitz story is just too graphic. While I commend Mr. Deem for highlighting several prisoners’ courageous stories, I could not recommend this title for teenage readers. I liked James M. Deem’s “Kristallnacht the Nazi Terror That began the Holocaust.” His ten chapters easily bring the reader from the first catalyst for Kristallnacht to Goebbels’ propaganda machine that turned public opinion against the German Jewish population. Primary quotes reinforced the photos which supported the stories of the victims and the villains. 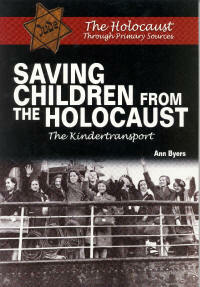 Ann Byers’ Saving Children from the Holocaust: The Kindertransport was an eye opener. Ms. Byers used the stories of several rescued children in showing how both upstanders and bystanders reacted to the influx of Kindertransport children to their communities. I chose Ann Byers’ Rescuing the Danish Jews: A Heroic Story From the Holocaust as my last read because I knew it was a story of courage and heroism. 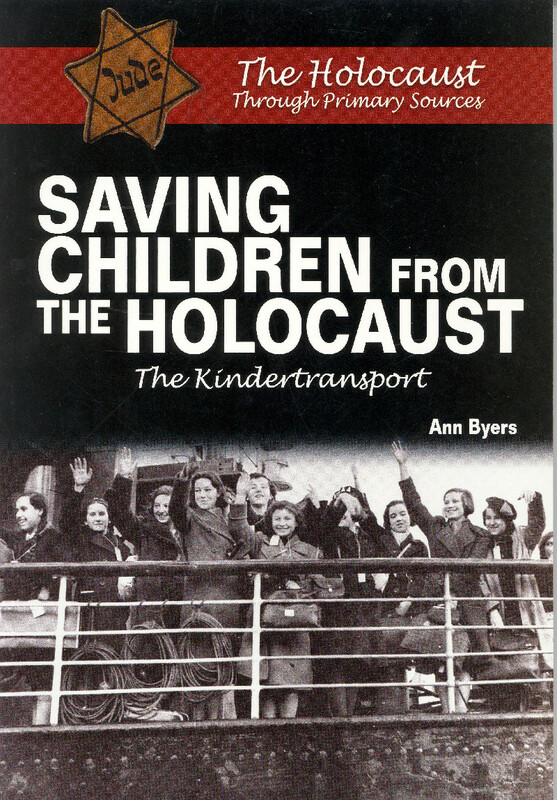 I knew about the Danish rescue of their Jewish population, but I did not know about the many heroes and upstanders Ms. Byers wrote about. This book left me hopeful and inspired. Each author in this series supported their victims’ and perpetrators’ accounts with detailed quotes and photographs. By enabling readers to view these events through the words of those who experienced them, the authors hope to make the reader understand and care more. I did, but I am already bought in, both as a Jew and as an educator. Trying to imagine the impact on a non-Jewish teenage reader, I can only hope that the stories of the brave resonate and remain. Unfortunately, there are no parent or teacher guides to accompany this series. There are no ways to debrief some of the inhumane and disturbing passages. These should not be books to read and then forget but catalysts for action and transformation. What will the reader remember and will these stories lead to change? I applaud the section in the back of each book that offers footnotes, a glossary, a timeline, further reading and Internet sources. Adding a few thought-provoking questions would certainly help clarify the author’s intent and provide an opportunity for discussion and action. Visit the Museum's ERC (Education and Research Center) and see what it has to offer. Diane E. Berg is the Director of Education at Temple Beth El of Huntington, New York. and offers this review as a service to Jewish educators throughout the world.